In December, the Discovering Community education program worked with Enosburg Falls High School Social Studies teacher Marianne Hunkin and her 9th grade students (all 80 of them) on a project to learn about Enosburg through interviews with community members. Over six days spent with the students in December, we discussed the reasons and ways in which humans share our experiences with each other; we dug into collaborative ethnography as a method of research, learning, and documentation; and we practiced with audio-recording technology and interviewing skills. 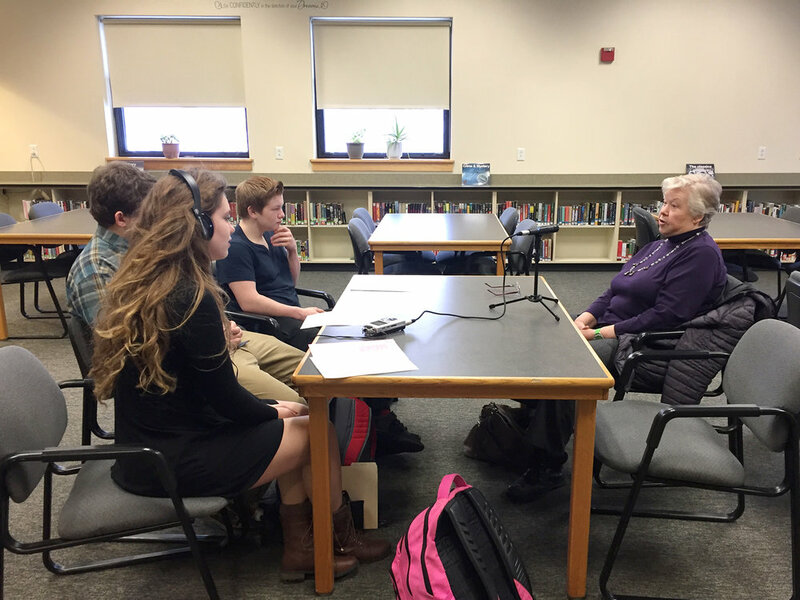 On Wednesday, January 17, students welcomed Enosburg community members to the school for interviews about who they are, about their memories and perspectives on Enosburg as a community, and about life in general. Talking with the students after the interviews about how they went, there was a lot of "I learned..." "I didn't know..." "I never thought about..." In the video below, Storm and Elizabeth share what they learned from their interview. Marianne did great work in designing this project and managing its logistics. Students thoroughly prepared, practiced the necessary skills and engaged deeply with the interview process and with the people in their community, and those people also participated generously and enthusiastically. Thanks to everyone for their efforts! We're excited to see what the students have to share when they present their interviews, work, and reflections to the public on March 9. Over the course of the fall, the VFC's Discovering Community education program also worked with Williston Elementary School, Killington Mountain School, Vermont Commons School, Harwood Union Middle School, and Putney Central School. Follow the Education program happenings at www.discoveringcommunity.org.